Why choose CHO CHARGE® Caffeinated? CHO CHARGE® is a scientifically-formulated energy drink designed to fuel and hydrate your body before and during exercise. Whatever your sport or activity, CHO CHARGE® can help you to perform for longer at a high intensity. By using CHO CHARGE® you will be fuelled, hydrated and ready to perform at your best in any demanding situation. Each serving (35 g in 500 ml water) of CHO CHARGE® provides a 6 % CHO solution that is optimal for the hydration and fuelling of the body during exercise. Follow CHO CHARGE® intake guidelines for appropriate hydration and to ensure maximum performance potential. Osmolarity is defined as a measure of solute concentration in solution. Osmolarity is an important consideration when designing a hydration and fuel mix formulation to aid in sports performance especially before, during and immediately after high intensity exercise. When mixed with 500 ml water, each 35 g serving produces a hypotonic solution (Osmolarity <278 mmol/L) allowing for optimum fluid and fuel absorption. Branched chain amino acids: CHO CHARGE® is enriched with branched chain amino acids (BCAAs) which are protein building blocks. BCAAS can speed up the recovery process by providing building blocks to repair damaged muscle fibres post-exercise. BCAAs have an important role in central fatigue during exercise; BCAAs intake in suitable amounts during exercise may reduce the feeling of fatigue and may improve exercise performance. Caffeine can spare muscle glycogen (carbohydrate), increase awareness, reduce the perception of exertion, increase resistance to fatigue and improve cognitive function during intense exercise. Consequently, caffeine may provide a vigorous boost to athletes who feel lethargic or fatigued before or during exercise. CHO CHARGE® Caffeinated has a high caffeine content, we recommend that you do not consume more than 3 servings of CHO CHARGE® Caffeinated within a single 6 hour period. After 3 servings, we recommended that you switch to CHO CHARGE® Decaffeinated. People sensitive to caffeine can alternatively choose CHO CHARGE® Decaffeinated to fuel and hydrate for exercise. Recovery: This product is not the optimal choice as a post- workout / training drink. Instead we recommend trying our Recover Ace® Endurance for recovery. 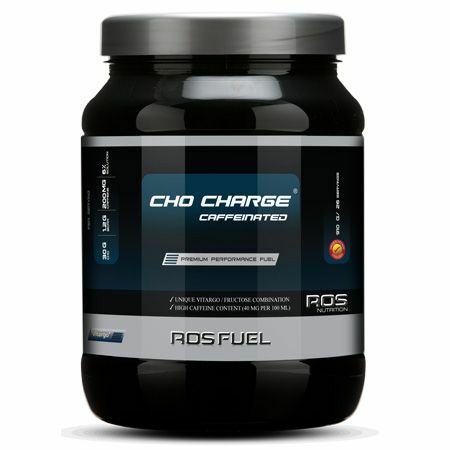 CHO CHARGE® Caffeinated is a registered trademark of ROS Nutrition Group Limited. Ingredients: Barley starch amylopectin (Vitargo®), fructose, L-leucine, trisodium citrate, sodium chloride, magnesium gluconate, potassium chloride, caffeine anhydrous, L-isoleucine, L-valine, zinc citrate, ascorbic acid, nicotinamide, dl-alphatocopherol acetate (50 %), tricalcium phosphate, D-calcium pantothenate, pyridoxine HCL, thiamine hydrochloride, cyanocobalamin. Blomstrand E. A role for branched-chain amino acids in reducing central fatigue. J Nutr 136: 544S-547S, 2006. Coyle EF, Hagberg JM, Hurley BF, Martin WH, Ehsani AA and Holloszy JO. Carbohydrate feeding during prolonged strenuous exercise can delay fatigue. J Appl Physiol 55: 230-235, 1983. Dougherty KA, Baker LB, Chow M and Kenney WL. Two percent dehydration impairs and six percent carbohydrate drink improves boys basketball skills. Med Sci Sports Exerc 38: 1650-1658, 2006. Jeukendrup A, Brouns F, Wagenmakers AJ and Saris WH. Carbohydrate-electrolyte feedings improve 1 h time trial cycling performance. Int J Sports Med 18: 125-129, 1997. Jeukendrup AE and Moseley L. Multiple transportable carbohydrates enhance gastric emptying and fluid delivery. Scand J Med Sci Sports 20: 112-121, 2010. Vist GE and Maughan RJ. The effect of osmolality and carbohydrate content on the rate of gastric emptying of liquids in man. J Physiol 486 ( Pt 2): 523-531, 1995. First pour 500 ml of water into a shaker, then add 35 g (1 scoop) of CHO CHARGE® to produce a 6 % CHO solution. Shake well and drink as your pre-workout/during workout drink. For easy mixing, use the ROS Nutrition manual shaker. CHO CHARGE® provides an optimal hypotonic (Osmolarity <278 mmol/L) solution in doses of up to 50 g per 500 ml. Hypotonic solutions are the most appropriate choice for optimum absorption of fluids and hydration directly before and during exercise.